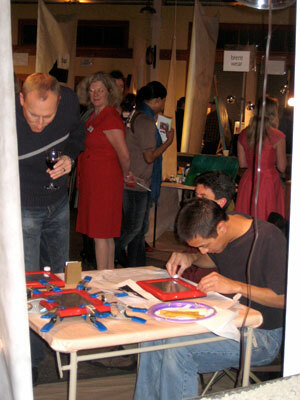 I had a great time Etch-a-Sketching at PULSE this year, using my new technique which involves transferring the glass with the drawing on it into a brand-new, not-yet-assembled Etch-a-Sketch. I'll post some photos of the process later on, but for now you can take a look at the three pieces I completed for the auction: Yes We Can, I Left My Heart in Portland, and Made in Oregon. If you're visiting my website for the first time, welcome and feel free to check out the links to the right. If you start with "About Rainy Bay Art" you'll see some new links appear at the top with notes about various things. Update 11.19.08: Over $95K was raised at PULSE this year for the Children's Heart Foundation! It was great to be a small part of that.